Lauren Herzak-Bauman’s work is informed by her contemporary art upbringing, taking influence from abstract geometric forms found in both urban and rural environments. 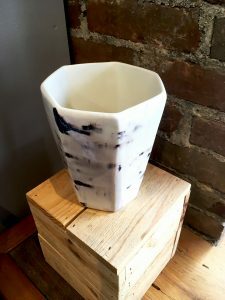 In addition to her functional ceramics, Lauren makes public art and sculpture, including commissions for MetroHealth, American Greetings, and the newly opened Hilton Hotel in downtown Cleveland. Born and raised in Northeast Ohio, she received her BFA in Ceramics from Bowling Green State University and her MFA in Studio Art from the University of Minnesota in Minneapolis. Lauren is 2016 Creative Workforce Fellow, utilizing her fellowship year to develop her public artwork. Her studio is located at The Screw Factory in Lakewood, Ohio. In support of our working artist members, enter our August giveaway for one of Lauren’s original ceramic vases when you visit this month. No purchase necessary. Congratulations to July winner David Aymat!